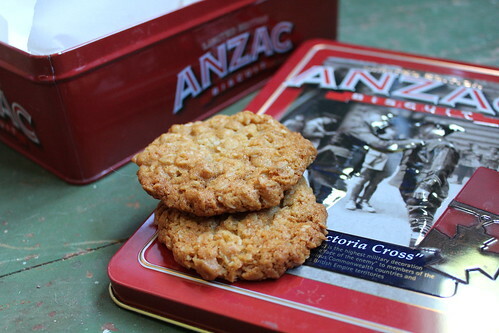 Anzac biscuits are a well-known and equally well-loved biscuit (cookie) that we share with our cousins over the ditch in Australia. There are heaps and heaps of recipes out in cyber-space, most of which have rolled oats, coconut and golden syrup. Some add spices, nuts, dried fruit or even chocolate: Dean Brettschneider has a delicious fruity Anzac biscuit here that includes sunflower seeds, dried figs and dried apricots. Chelsea Sugar have a delicious version with chocolate chips and dried apricots. And I have created a version (with apple syrup instead of golden syrup) that are studded with golden chunks of dried apple that I call Applezacs. 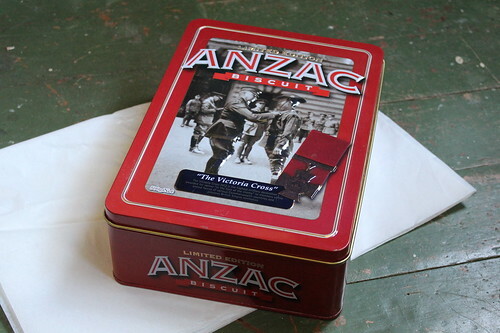 As an aside there is also an interesting history about the Anzac biscuits that can be read on the National Army Museum website here.